Balint Charities, Inc., was created to provide books and musical instruments to young children growing up in families who may lack the resources to provide these items in the home. A 501(c)3, Balint Charities seeks to strengthen school success by enriching young lives with reading and music. We believe that ALL children deserve to know the joy of reading books and playing music from a young age! Through grants and private donations, we acquire books and instruments for children in need. We seek out small groups, individuals, and charitable organizations who help us by holding book drives or gathering gently used or new musical instruments. We then work with agencies, schools, teachers and other non-profits to distribute these donations directly to children and their families. How to support Balint Charities, Inc.
Balint Charities currently focuses on two projects: Barb’s Books and Fran’s Bands. Help us share our passion! Donate gently used or new books for children. 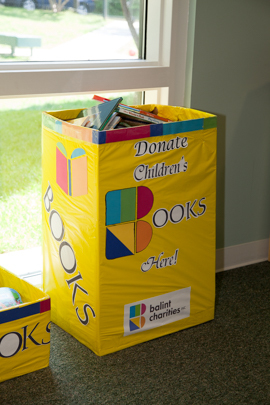 Hold a children’s book drive with your organization or group. Have a lonely musical instrument that needs a good home? We can help to get it in the hands of a budding young musician! Balint Charities, Inc. is a Washington, DC metro area nonprofit 501(c)3 founded by Kathleen Christesen to honor her parents, Fran and Barb Balint.